U.S. Rep. Tammy Baldwin celebrates her victory over former Republican Gov. Tommy Thompson on Tuesday. Wisconsin Democratic Rep. Tammy Baldwin became the first openly gay U.S. senator on Tuesday, defeating popular former Gov. Tommy Thompson, NBC News projected. 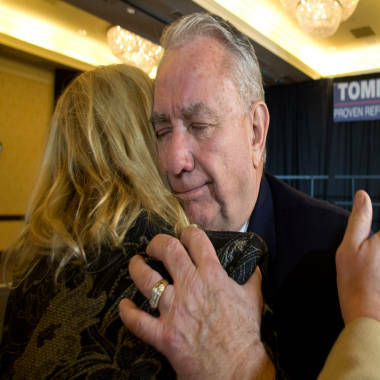 U.S. Senate candidate Tommy Thompson gets hugs from supporters after conceding defeat. Thompson, who served as Secretary of Health and Human Services in the administration of George W. Bush, retired from politics in his concession speech. The Senate race was the most expensive in state history with the two candidates raising at least $65 million, Reuters reported. Baldwin will take the seat of Democratic Sen. Herb Kohl, who is retiring after his fourth term. Baldwin, 50, is a former Wisconsin assemblywoman who was first elected to Congress in 1998. With her projected victory, she also becomes the first female senator from Wisconsin. Baldwin joined protesters at the state capital in Madison who objected to Gov. Scott Walker’s proposed curbing of collective bargaining rights for public workers. Baldwin's sexual orientation wasn’t a major issue in the campaign. Baldwin is expected to be replaced in the House by Democrat Mark Pocan, also an openly gay politician. Baldwin promised to support investments in infrastructure, education and research to create jobs in her campaign. She also painted Thompson as favoring tax cuts for the wealthy. Thompson argued that lower taxes, fewer regulations, large spending cuts and entitlement reform will boost the sluggish U.S. economy.